Tailgate chain covers protect your paint from the chain links contacting your bedside or tailgate. 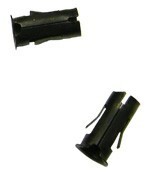 USA1 offers tailgate chain covers in black or clear. 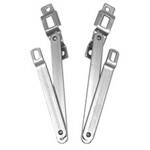 USA1 Industries offers replacement tailgate chains for your stepside truck in zinc or chrome plated. 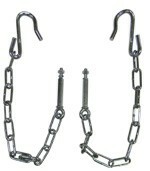 Each kit includes: hooks, eye bolts, washers and nuts. USA1 offers quality stamped steel reproduction tailgates to replace your rusty or damaged panel. Fits Stepside models only and has no letters. Truck Freight!!! 1954-87 Chevy & GMC Truck Stepside Tailgate Trunions, Cadmium Plated Steel, pair with cadmium plated bolts. Upgrade your Chevy or GMC Stepside Truck's Tailgate Trunnion to these new Polyurethane Trunions with new stainless steel bolts and washers. Restore your Chevrolet truck's damaged or rusted tailgate with this brand new Chevrolet embossed tailgate. Truck Freight!!! 1967-72 Chevy & GMC Truck Fleetside Tailgate Bumpers, 4 pcs. Kit includes upper and lower bumpers. Add a custom look to your Chevy or GMC Truck with this chrome tailgate handle for fleetside models only. Tubular metal clip that attaches rod to tailgate handle, requires 2 per truck.